When facilitating expressive art for incarcerated youth, the teens in my group were self-conscious and suspicious about art-making. Most felt that they did not have artistic "talent". Interesting a skeptical group of teens to create expressive art became a grand experiment. My challenge was to make art-making fun and interesting - in a way that was expressive but not overtly therapeutic or requiring of "talent." The key to success, when working with teenagers, was to provide art projects that could not be easily evaluated. 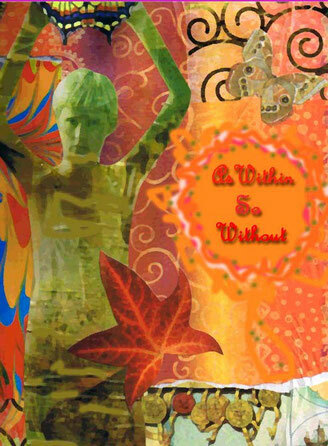 I designed art projects that were fun, contemporary, surprising, challenging, and even humorous in scope. My art group grew over time. Many teens came to experiment with art-making in a way that made them forget their self-consciousness for a while. 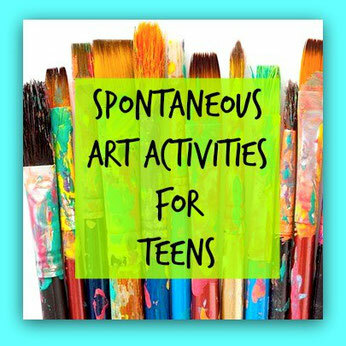 Following is a list of art activities for teenagers that encourage spontaneity, original thinking and imagination. All projects focus on the creative process instead of an end-product. Adding a sense of urgency to finish an art project increases spontaneity. Most teens love to compete with their peers. Offer a set time limit and create an art challenge that does not allow time for self-conscious thought. Defacing photographs is a fun activity for teens. This can be a therapeutic and humorous art exercise that does not require drawing or painting skills. Invite your teens to alter magazine photos with oil pastels and acrylic paint. Matte magazine imagery works best. Oversized fashion magazines with black and white photos can be purchased for this activity. Have magazine pages pre-cut so group members do not spend group time reading the magazines. Give each teen a roll of tinfoil. Set a time limit of one hour and ask each person to make a sculpture using the entire roll of tinfoil. Asking teens what words they live by can be a revealing exercise. Offer a personal example of what words you personally live by. Go around the art table and ask each member what motto they live by. If they do not know what their personal motto is - that is ok.
Have a wide variety of quotes available printed on paper and cut into strips. Ask each member of the group to create a collage that represents their "words to live by" quote. Because it is important for teens to define themselves, often their quotes might reflect a negative or subversive world view. All views can be discussed in the group. Team your teens up into group of two or three and challenge them make a collaborative painting or sculpture. At the end of the competition offer prizes to every team. Chocolate bars work well! Reward and define the strengths of each and every art piece - such as, "the most colorful sculpture, the most original sculpture, the most surprising sculpture," etc. Everyone gets a prize. Providing activities that cannot be predicted invokes excitement and mystery. Pre-paint sheets of paper with dark blue or black paint and crinkle them up into a ball. Have the balls of paper set up in each place. 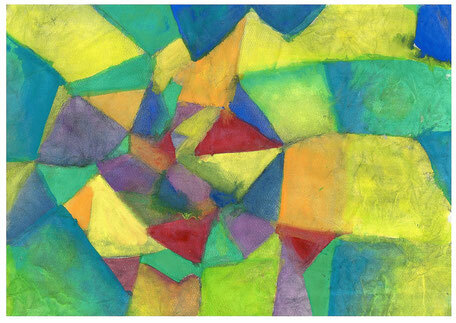 Ask teens to create a spontaneous painting using the lines on the crumpled paper. This project can be painted in 3D or 2D formats. My favorite place to shop for art supplies was the dollar store when I leading teen art groups. I was always looking for surprising objects to incorporate into artwork. I assembled piles of random items such as pipe cleaners, wood shapes, small toys, fabric scraps, yarn, buttons, screws, nuts, and bolts etc. I would ask teens to make an assemblage using the items in front of them. These kinds of art exercises resemble childhood play and can keep participants absorbed in creating for a long periods of time. This can be a large scale painting done on large sheets of paper on the floor using pour-pots of latex paint. 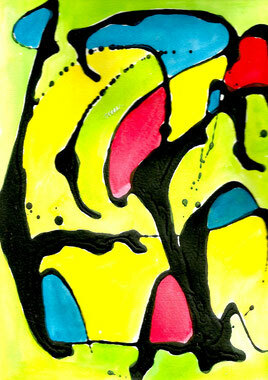 This painting can also be created on a small scale using watercolor paper and paint. 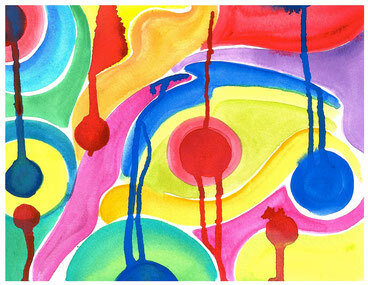 Organic watercolor shapes can also be painted on the background prior to the drip painting. One teen told me that when he was in solitary confinement he got in trouble for making sculptures out of toilet paper, coffee-mate, and water. I thought, "What a brilliant idea!" The next group session I provided each teen with a roll of toilet paper, and a dish of flour and water. Offering structural items to hold up the sculpture is helpful, such as coat hangers, pipe cleaners or popsicle sticks. Invite your teenagers to tear up two or three magazine pages into squares without telling them why. 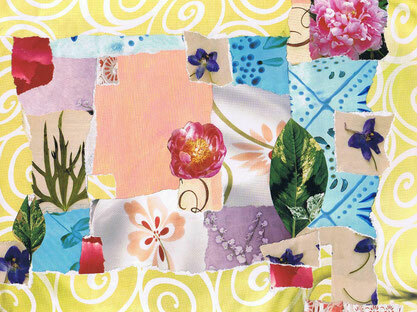 Give them a timed period to collage a "crazy quilt". Alternately you can have a pile of pre-torn square collage pieces in a pile in front of each person along with a piece of paper. Challenge them to cover the entire piece of paper in 15 minutes or less. 11. What Are They Thinking? In this exercise, it it is important to reveal the process step-by-step. 1. Have large sheets of paper set before each chair, along with one magazine, scissors, glue stick, and a black felt pen. 2. Ask teens to pull out pictures of five people, cut them out, arrange them on the paper and glue them down. 3. Invite the members of your group to draw a thought bubble above every head and write what each figure is secretly thinking. 4. Invite members to share as a group afterwards. This exercise can be quite humorous! If you have a permanent art studio or craft room, invite your teens to participate in an ongoing group mural process. This exercise promotes collaborative group expression, as well as the invitation to create when inspiration strikes. Tape or pin large sheets of bristol board or cardboard on the wall. Have covered containers of tempura paints and brushes available. A group theme can be decided upon ahead of time or you can simply let the process evolve organically. Loose organic shapes can be sketched out as a structure to begin with. The mural can be abstract, symbolic or realistic. Teens can paint and draw on the mural whenever they want to. The mural can be a way to paint group concerns or interests in an ongoing manner. It is helpful to outline and to post up a list of parameters or chosen themes beside the mural. Invite your teens to design their own graffiti signature/tag with felt pens and or paint. Tagging can be done small scale with felt pens or paints. Invite your teens to draw an outline of their initials and doodle within them. Provide examples of graffiti art for inspiration. Tags can be an ongoing project especially if they are elaborately doodled. Have piles of junk available to create a large group sculpture such as old household items, toys, colorful straws, chicken wire for building forms, and building construction refuse such as colorful electrical wires, etc. You can also encourage teens to create a junk landscape on a large board, or a large collaborative mobile out of junk. Provide a creative array of gumdrops, marshmallows, cookies, candy, chocolates, as well as structural items such as toothpicks and longer skewers to create edible candy sculptures. 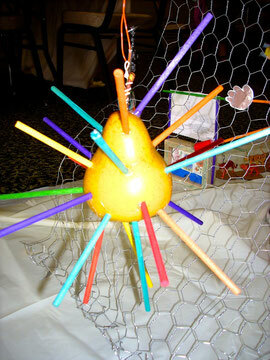 This is a humorous and engaging activity that can be created on a large scale as a group for special events. Purchase black or white t-shirts and provide colorful latex house paint for teens to paint their own t-shirts. Latex paint can be diluted down or left as is. Provide photocopied examples of simple, colored patterns and designs for reference. Latex paint on fabric is a little stiff but it washes well, is colorfast, and does not require heat-setting. This exercise works best in groups of five. This is a good exercise to increase feelings of self-esteem. Have each teen trace out his or her hand on a piece of paper. Ask each person to cut out their traced hand, and letter their name on the palm of their cut-out. Then, in a round robin, have your group pass each hand around the table. Ask each group member to write a positive quality about the person upon one of the fingers on the paper hand. When the hand reaches its owner invite each person to reflect upon the positive feedback and embellish their inspirational hand with doodling, ephemera or inspirational quotes. Begin by asking your teens to tear up various colours of tissue paper into large and small shapes and sizes. Provide white card stock for collage background. Instruct each artist to cover their entire background surface with white glue thinned with water. Working very quickly, invite your group to place large and small pieces of tissue paper on the wet glue. Brush the top of each piece of tissue paper with glue as well. Suggest starting with the lightest coloured tissue papers first, towards layering the darker colours on top. Or, the darkest colours can be the base, with lighter and brighter colours added on top. The entire surface of the collage can be coated with diluted white glue, taking care that the glue is thin enough so that it does not tear the tissue paper. 1. Place 2-3 magazines in front of each teen and ask each person to cut out ten images and ten words or phrases that attract their interest. 2. Ask each teen is cutting out their imagery, pass a large black poster board around the art table and invite each participant to add one image or one word/phrase before handing the collage to the next participant. 3. Encourage the group to fill the entire board and to layer and glue the imagery and words in interesting and absurd ways. 4. When the collage is finished, invite the group to identify themes and visual stories, in order to decide upon a name for the group collage. This is a process art technique that cannot be pre-planned. This technique provides an opportunity to play with "fail free" abstract painting as originated by artist Jackson Pollock. Ask teens to pour black latex paint onto a sheet of watercolor paper in free-form poured lines. Allow poured lines to cross and form interesting shapes. 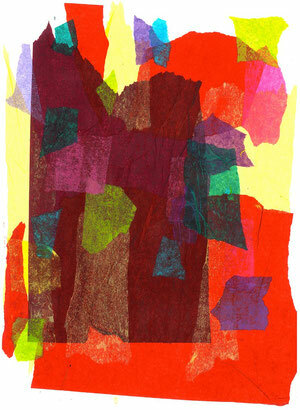 Teens can also "rock" the paper to create spontaneous designs. Allow lines to completely dry and provide watercolor paint to to fill in the shapes with color. 1. Ask your group to form into pairs and invite teens to discuss what they would each like as a self-defining tattoo. 2. Ask each teen about what is most important theme as the foundation for their tattoo design. 3. Provide simple photocopied samples of tattoos downloaded from the internet for ideas. 4. Using Cray Pas water soluble crayons and fine brushes invite teens to take turns painting tattoos on each other. 5. Invite your group discuss the deeper significance of their tattoos with the group.